In 2018 my word for the year was CALM. I have always felt like the proverbial duck: seemingly serene and calm to others while frantically paddling under the water. I believe deeply that the best outcomes result from being truly present to my circumstances and my goal was to feel in that zone on a daily basis. Like Neo seeing through the Matrix, I wanted to unplug from the machine. So the big win was when my stepson exclaimed on a trip to New York “Claudia I don’t think I have ever known you to be so calm”. He said the exact word, CALM. I beamed with pride and also quite a degree of guilt for the insanity the poor kid had to deal with while living with me. Wow, I must have aced that goal for someone to notice it unprompted. I can raise my hand and admit that when I set goals I expect to ace them. I expect to be able to give myself an A+ on the test, tick it off as ‘done” and then go onto the next step. Always seeking some lofty ideal of perfection and needing to win the race rather than be in the race. Our lives become very binary, full of ‘dualistic thinking’: we win or we lose, we pass or we fail, it’s a good hair day or it’s a disaster. Dualistic, judgmental, thinking is of the linear modality. Observing this in myself is a great reminder that my squiggly path continues. As squigglers it is not the win per se that we are striving for, we are more oriented to the constant learning and, hopefully, we are constant evolving. In a binary mode we constantly judge ourselves and others. We show up to life oriented to like and dislike; limiting our experience of what is truly happening. Our judgments hold us contained in the past, because that is when we decided what we like or don’t like. What if we read a facebook post without first determining whether the person was right or wrong and instead truly absorbed their opinion, seeking to understand? What if we show up to work tomorrow and really experience our day instead of just going through the motions and answering email and slack messages like a zombie? The quote from Lion’s Roar is from a post that concludes “What would it be like to truly admit that we don’t know, on the very deepest level?” Does that question punch you in the gut as much as it does me? What if I don’t know and, more importantly, what if I don’t need to know? This strikes at the heart of squiggling - we move forward in anticipation of what we will learn and not in anticipation of getting it right. I think that is why I like the corny show on Netflix “Nailed It”. They seem to understand the sheer joy of experience, I am quite sure none of them are deluded enough to think they will achieve perfection. From this orientation we gain the true learning and the true knowledge that will allow us to soar. We squiggle not to opt out; our goal is not a participation trophy, our goal is to see what others don’t see and allow that to forge a unique path. A path where we get joy from the full experience, the forwards, the sideways and even the backwards. The full experience will allow us to navigate through to the greatest possible expression of our life. The goal is not perfection. As hard as that is for me to tell myself: the A-type, once-lawyer, goal-obsessed self that wants to get everything just-so. The goal is more beautiful than perfection, my goal is imperfection. Perfect imperfect. I doubt I will ever stop hearing the incessant self-critical chatter in my head, there will always be that constant reminder of how far from perfection I am. That is ok, my work is to not react to those binary judgements. My work is not to be a prisoner of my judgmental mind. That will likely be my life’s work. I step forward in 2019 with the intention of observing, not resist affixing a label good, bad, like, dislike. To observe and, rather than emotionally react to my circumstances, to respond with as much non-judgment that I can muster. My ambition is to strive for the non-binary, to observe rather than judge. As Deepak Chopra teaches, when we judge we make another person wrong - often that person is ourself. So my new word this year is PRESENCE. A word that always makes me laugh because, in New Zealand, we use that word to mean ‘gift’. 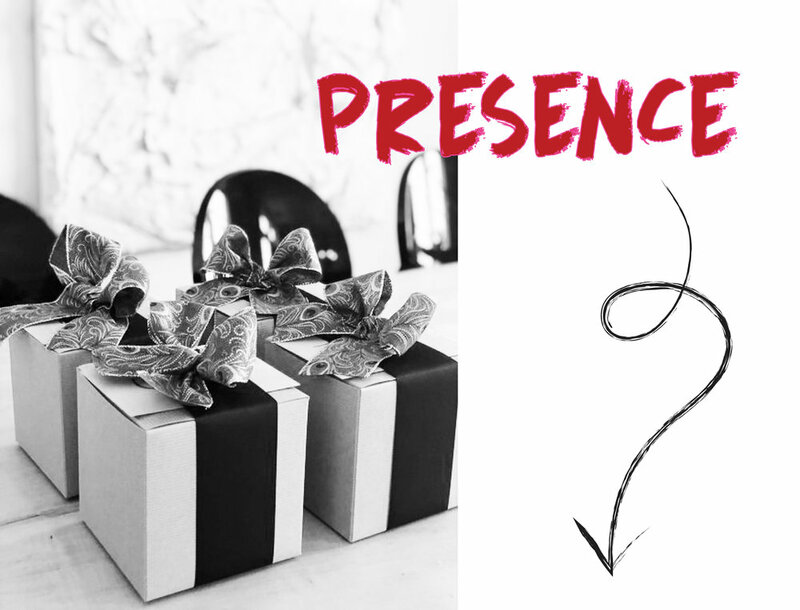 Which I think truly is perfect: Presence is possibly the best Present, the greatest gift we can give ourselves.